As you know dear reader I like to keep abreast of the latest digital disruptions and the amazing “new rules” of marketing they have introduced. How will the old rules survive? 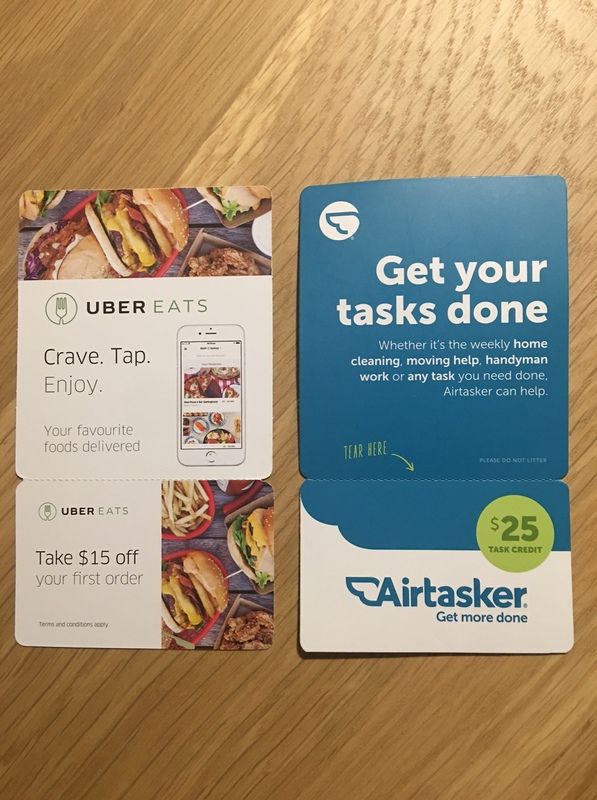 So I thought I’d share the most recent ads that launched Airtasker and Uber Eats in my suburb. Here’s an earlier post on similar disruption technology. The brands are obviously on to something, as they used identically shaped die-cut cards. 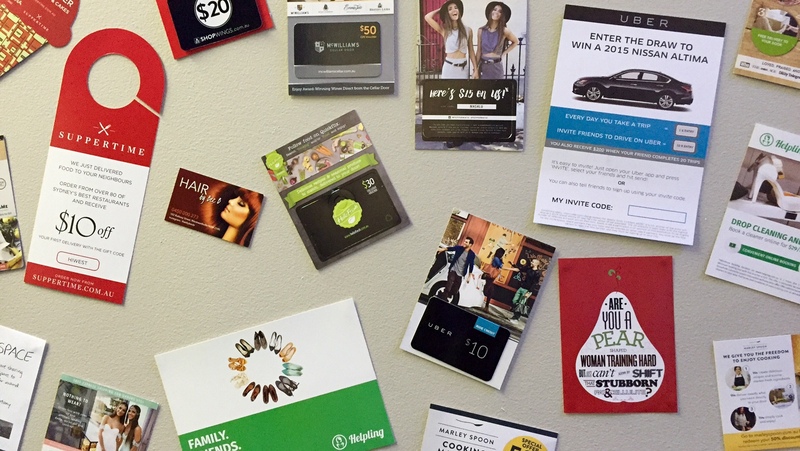 These disruptive cards included a discount to encourage people to trial the services. Such innovation. 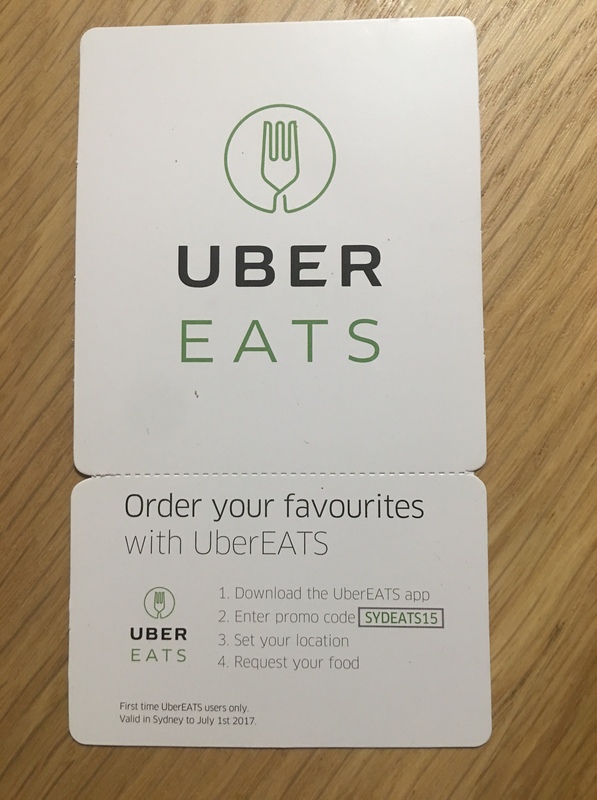 The Uber Eats card was in my letterbox, along with at least a dozen non-disrupting brands. So now I can use my phone to order cooked food delivered to my home – unbelievable. 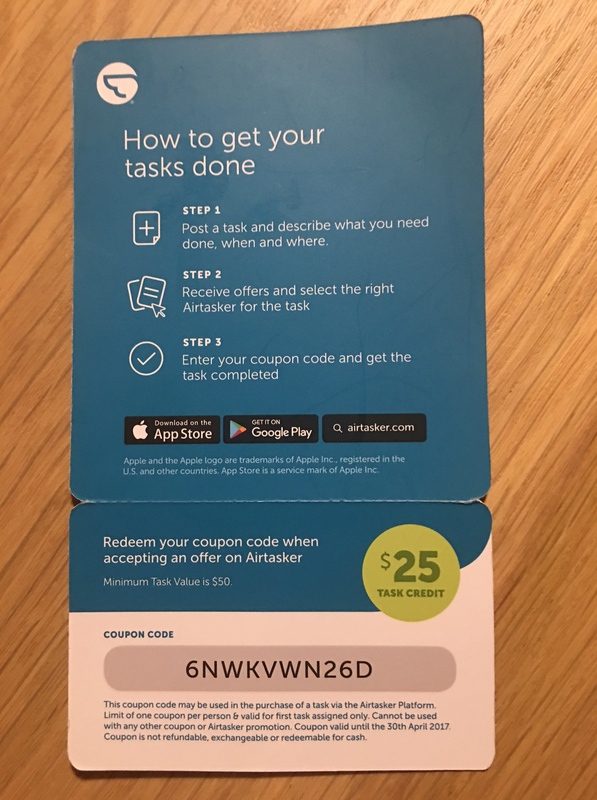 While the Airtasker card was shoved in my hand at the shops – I think I was on a customer journey at the time. Let me recall – I had my backpack, water bottle, GPS map, crampons (just in case any climbing was required – who knows where a customer journey will take you?) and my sunblock. Yes, I remember now. I was on a customer journey to buy some bread when a random stuck out their hand and gave me the card. So there you have it folks – amazing insights into the new ways of marketing by the digital disrupters. Fascinating stuff indeed. Have to go now. Am going on a customer journey to get some milk. Where are my hiking boots and personas? Hint to Telstra – Australia wants your service to work properly, Australia is not interested in your rebranding…. On Friday I received an email from a computer at Telstra. It was an announcement that mainly caused me to shake my head in dismay. True dear reader. Apparently rebranding is the priority of the company that specialises in regular service outages, digitally disrupting businesses from functioning, preventing kids from doing homework and generally stopping people connecting in the connected world. 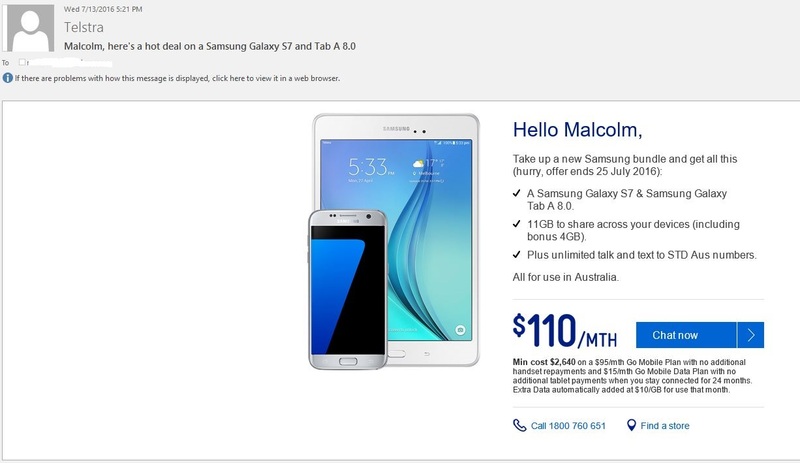 Someone needs to explain to Telstra what digital disruption really means. 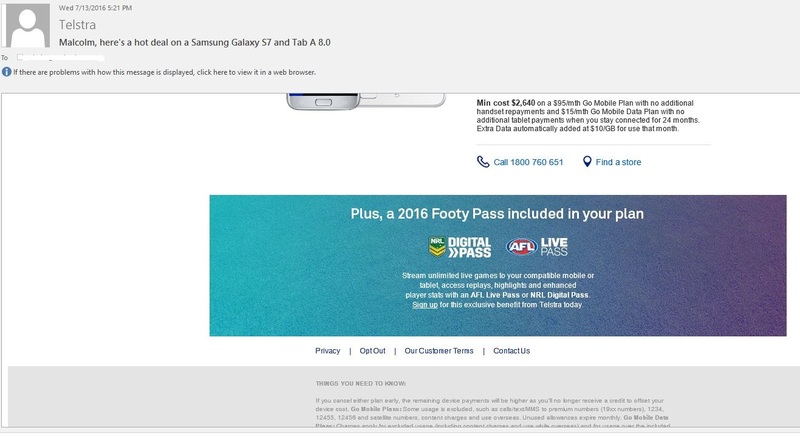 The disruptions have happened so often that Telstra’s compensation offer of a free data day, now falls on deaf ears. Australia (to use Telstra’s collective noun for all people and businesses in this country) is fed up – we just want our internet and phones to work. After all that’s what we pay for. Well we pay more than that – if we want Telstra to mail monthly invoices to us, because we cannot rely on their internet to deliver it by email, we have to pay north of $3 an invoice. If this was a third world country there’d be riots in the streets. There is nothing more important to us than our customers, so before we share the next chapter of our brand story with the world on Sunday night, we wanted to share it with you. On what planet do these people live? What Telstra customers have bookmarked the Telstra brand story, anxiously awaiting the next chapter for their reading pleasure? Change hands please, we customers are begging you. The message continues with a link to a video and a subtitle “Click to watch the film“. As they say, the devil is in the details and I suspect if you click you’ll watch a video not a film. This ignorance of small data is what Telstra is famous for, apart from digital disruptions. 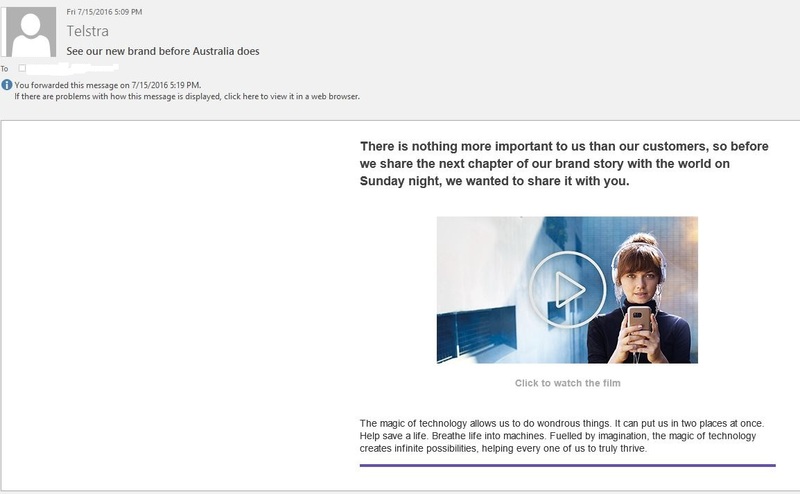 Here’s an email Telstra sent to me two days before Friday’s rebranding message. Note to Telstra: I am currently about six months into a two-year iPhone plan with you. Why would I even consider switching to a Samsung now? 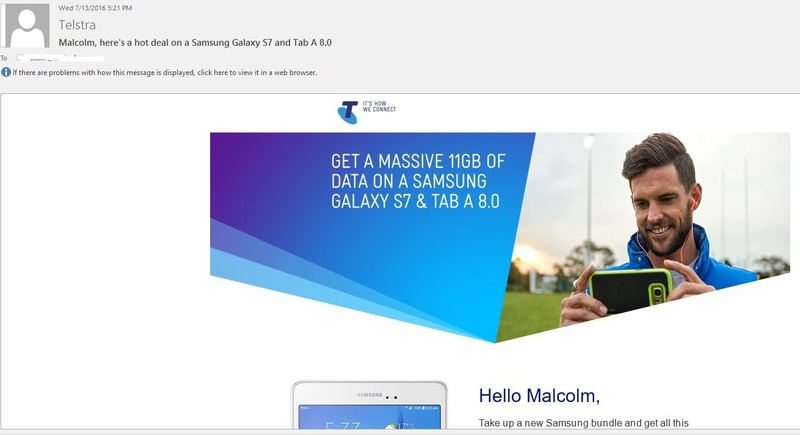 The computers at Telstra must know what phone and plan I’m on – aren’t I one of those customers referred to in the rebranding message – who are supposedly more important than anything else? 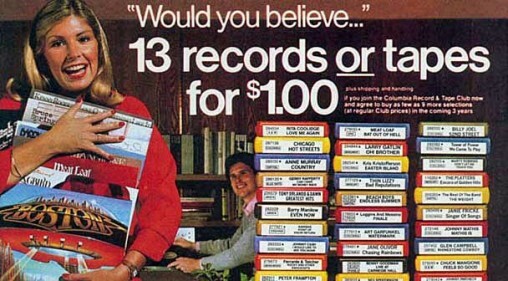 This is the simplest and smallest of data – a customer’s record. How does Telstra continue to get things so wrong? Why is mediocrity such a respectable KPI at Telstra? But hey, why get the small customer data correct when you’re doing a rebrand? In case you are waiting with baited breath dear reader, the rebrand is all about the magic of technology. And I must say it does reflect Telstra’s technology – it magically disappears when you want to use it. You can watch the magic of technology here, or maybe you can put the garbage out, you’re call. As a shareholder I’m so pleased Telstra is focusing on rebranding, rather than providing a service that works when I need it to. That’s sure to keep the analysts and the customers happy. Gotta go – need to put the garbage out. Once again this week, I saw another media article about the amazing digital disruptor, the Dollar Shaver Club. By all accounts it is a very successful company. And so it should be. It has taken a 17th century publishing model and used 21st century technology to digitally disrupt an industry. Amazing stuff. After all, who would have thought people would order a product remotely, rather than walk into a store, and get the company to deliver the product to them by mail? This type of innovative thinking is digital dynamite. To think that a company can completely disrupt human behaviour by applying one of the most continually successful analogue business models to a digitally-based business, well it’s just business gold. The business model is called the subscription model and it uses a negative option offer. A negative option purchase is one whereby the customer agrees to have goods or services provided automatically, and the customer must either pay for the service or specifically decline it in advance of invoicing. 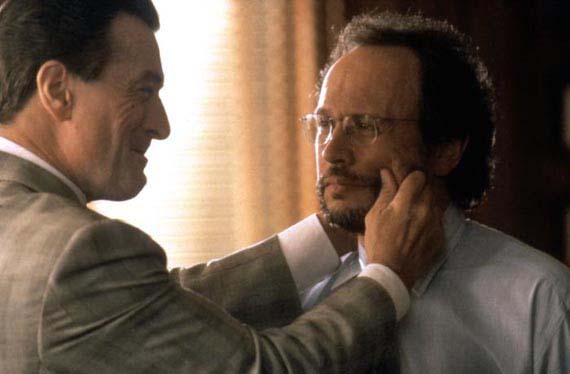 And this may come as a surprise to some of you dear readers, but Dollar Shaver Club was not the first to offer a negative option. Strange but true. Research indicates the subscription model first started in the publishing industry in the 17th century in the UK. Over time it expanded to the US in the 19th century when chapbooks (cheaply printed paper covered books) were sold door-to-door. Regular readers will know that door-to-door selling is now one of the primary channels for digital distruptors like Uber, Hello Fresh, et al. 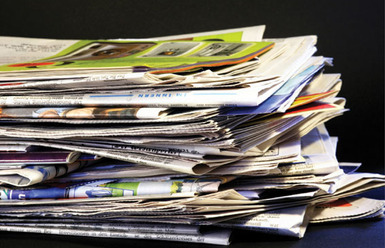 As markets grew and new technology disrupted society – automobiles, telephone, courier services, faster postal services – the subscription industry boomed. By the mid 20th century you could order books, magazines, vinyl records, plates, stamps, collectibles, vitamins, cosmetics and food – all delivered to your home, using a negative option payment method. 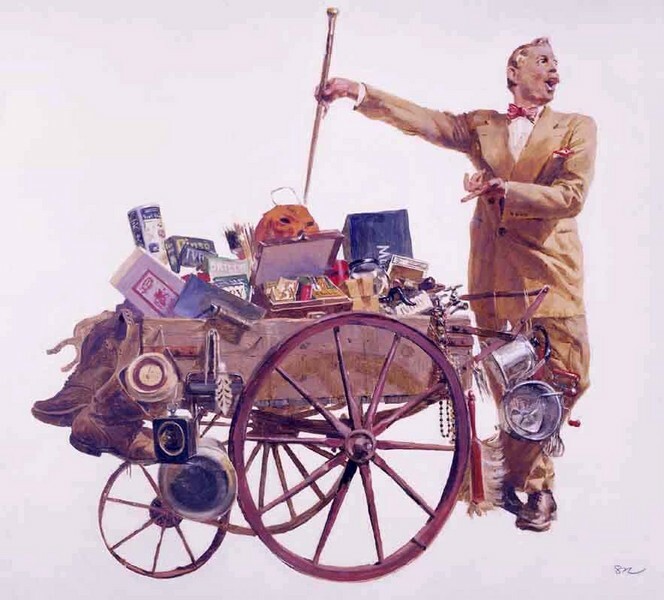 By the end of the 20th century in addition to the items above, I’d worked with clients selling wine, nappies, car washes, food, CDs, DVDs, education, tools, newsletters, coffee and more on a negative option subscription model. In fact, any regularly consumed item is perfect for a subscription model – as long as the cost of delivery is not prohibitive. Many business software programmes are now sold on a subscription service – including this blog platform for example. So let’s quickly look at Dollar Shaver Club. In Australia they provide razors for either $4, $7 or $10 per month. They mainly promote their business using the digital medium of television. 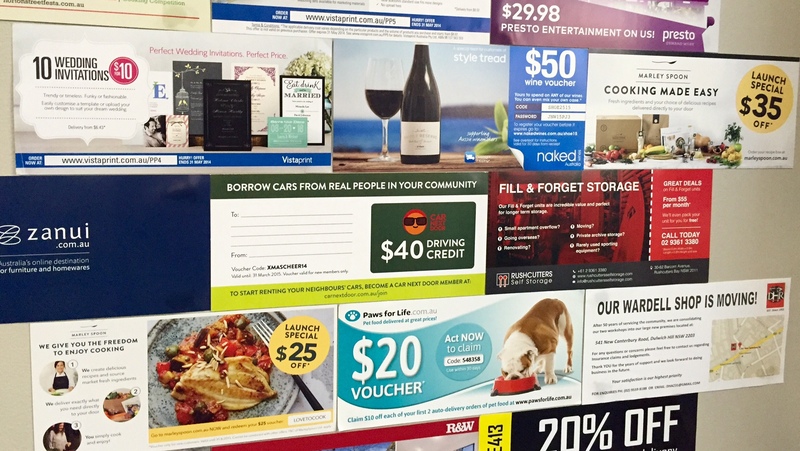 You select the offer you want from the website and then keep an eye on your letterbox. Your razors arrive by post and that’s one less item you need to worry about when you go shopping. Marvelous stuff. These digital disruptors are bloody geniuses. Who’d have thought hey? But congratulations to the lads who built the business. They understand that technology changes – human nature doesn’t. Humans all love a bargain and as the laziest species on the planet, we love things made easier for us. Tap into those two emotional triggers and you can make money. 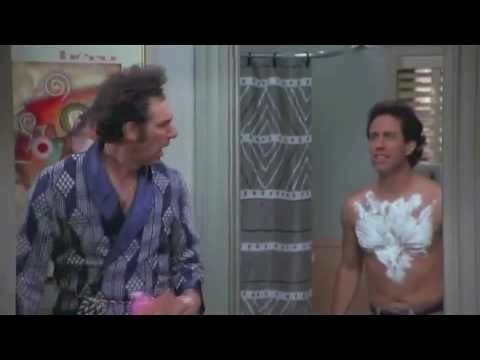 I’m off to a meeting, better have a shower – where’s my razor?